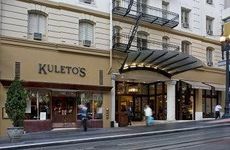 Find Villa Florence San Francisco on Union Square deals, discounts and special offers. Located right by Union Square, the hotel embodies a modern Italian villa and has a complimentary business center. Fusing old-world hotel elegance with contemporary glamour, this newly redesigned hotel features in-room spa treatments. A landmark Nob Hill hotel, the Fairmont features redecorated, spacious guestrooms and suites each with a flat screen TV. In the Yerba Buena district, near Union Square, the Four Season has 277 guest rooms & suites, on-site spa, great views. Located in the financial district, the Galleria Park offers flat screen TVs, an urban park and spectacular views. The Grand Hyatt offers opulent and spacious rooms with floor-to-ceiling views from its Union Square location. Hotel features 544 rooms with flat screen TVs, spa, fine dining room and lounge. Contemporary styled, boutique hotel near San Francisco Fisherman's Wharf features fine dining and a relaxing lounge. The boutique hotel, near Union Square, has a world-class spa, fine dining, upscale lounge, & fitness center. Nikko, north of Market, has 533 rooms and suites with flat-panel TV, rejuvenating spa, pool, dining and cocktail lounge. The Hotel Zelos, near SOMA, includes world-class dining at The Fifth Floor Restaurant, in-room spa services, fitness center. With décor inspired by art & literary salons of the 1920's & 30's, the hotel hosts literary events in the bar. A modern design hotel on the waterfront, the Vitale offers spa, yoga, and rooftop soaking tubs. Right at Fisherman's wharf, the Hyatt has a sports bar, fitness center and heated outdoor pool. Near the Opera House and Symphony hall, the Inn at the Opera is a European style hotel. Rooms have high-speed internet. Located at Union Square, the JW Marriott is a contemporary styled hotel, smoke free, with a world-class restaurant.